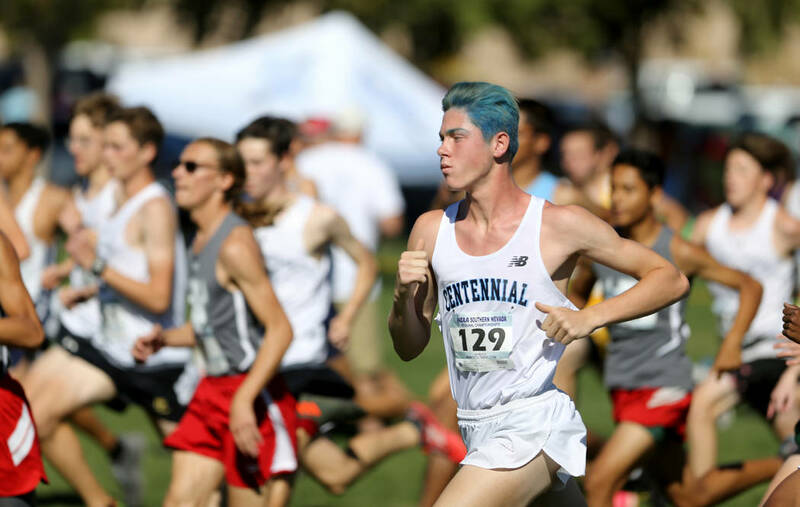 Nicholas held off hard-charging Massimiliano Swenson of Bishop Gorman to become Desert Oasis’ first region cross country champion. The Diamondbacks also won the boys region team title, another first in school history. 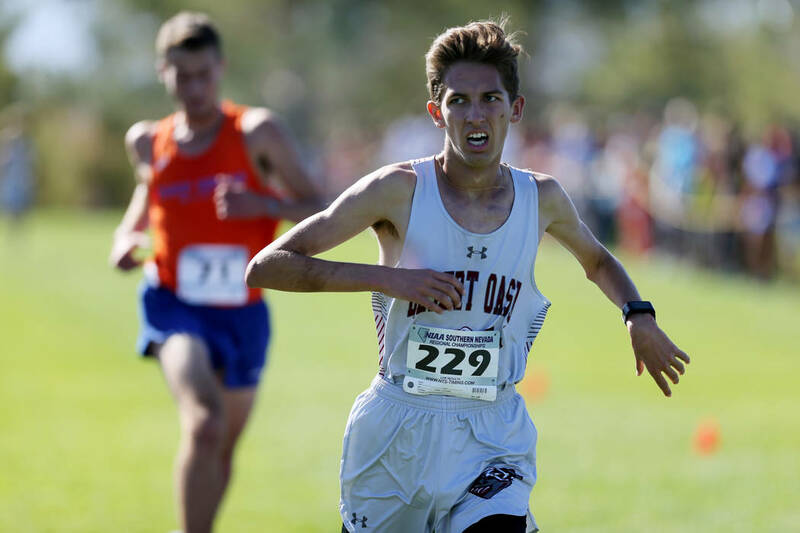 Conner Nicholas didn’t have his usual kick in the end, but the senior had enough to help Desert Oasis deliver a historic day at the Southern Region Championships on Friday. Nicholas held off hard-charging Massimiliano Swenson of Bishop Gorman to win the 3.1-mile Class 4A Desert Region boys race in 16 minutes, 54.1 seconds at Veterans Memorial Park in Boulder City. Nicholas became Desert Oasis’ first region cross country champion. The Diamondbacks also won the boys region team title, another first in school history. The Mountain Region race wasn’t decided until well after it ended. Palo Verde senior Noah Jordan took the lead late with Arbor View senior Noah Ayala in second. Jordan made a turn off the course late, tried to recover, and wound up crossing the finish line first with Ayala a few seconds back. 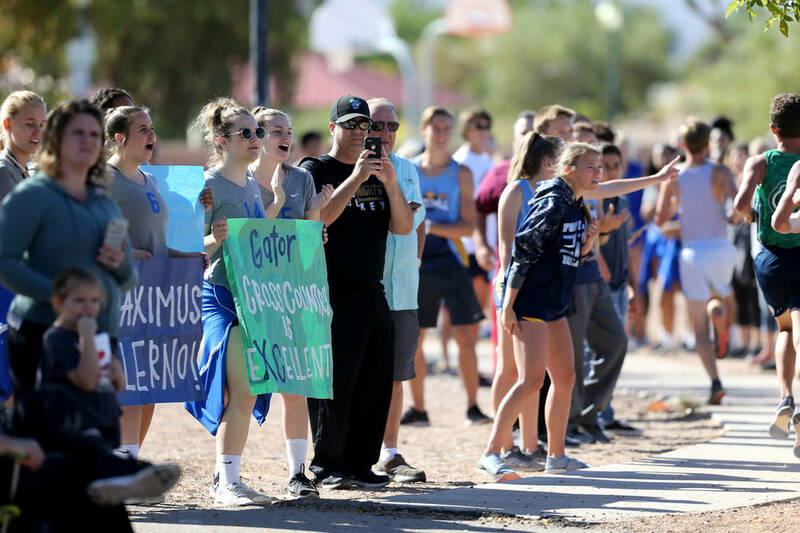 Arbor View protested, and Jordan was disqualified for going off-course. 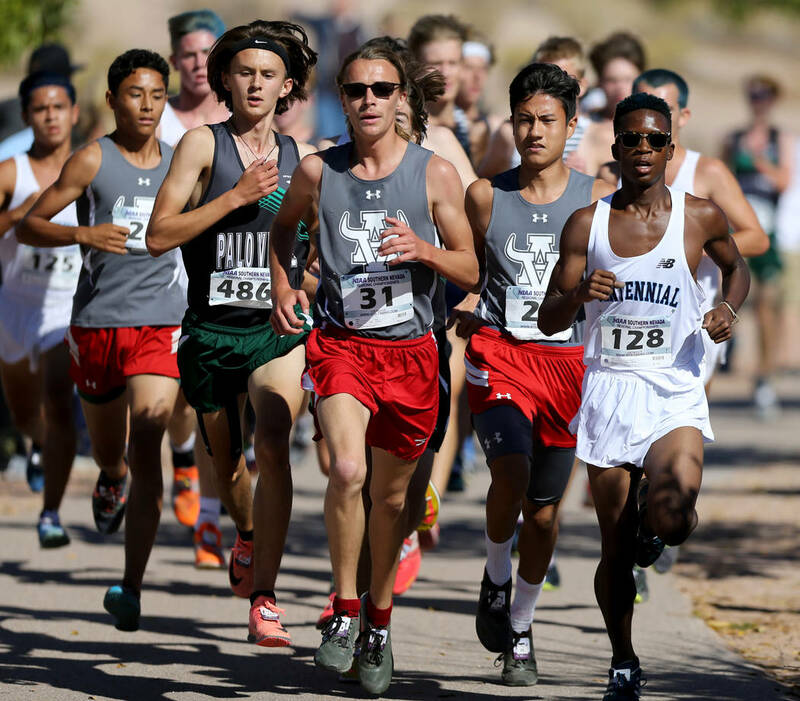 Ayala was bumped to first and Arbor View took third over Palo Verde for a state qualifying berth, though the Panthers will still be well-represented at next week’s state meet. In the 3A Southern Region race, Valley junior Christian Franklin easily won, and senior Ian Cook of The Meadows won the 2A region title. A pack of runners came out quickly with Nicholas settling in at the back of a large pack for the first mile. The senior moved forward by the second mile and was joined by Desert Oasis teammate Landon Morrison and Swenson. Swenson was still sticking onto Nicholas’ shoulder with half a mile to go. Nicholas made one more surge to build a gap and then managed to hold Swenson at bay in the end. Morrison was third (17:06.2) followed by Spring Valley senior Jacob Potere (17:11). Foothill freshman Nathan Carlin was fifth in 17:21.3. Desert Oasis scored 41 points for its first region title, easily outdistancing Green Valley (78) and Coronado (85). Eventually, by the second uphill climb on the rough sandy portions of the course Jordan, Ayala, Centennial’s Alexander Miller, and Faith Lutheran’s Aidan Baughan moved to the front. Jordan started to pull away with only Ayala left to give chase. Then, came a fateful turn at a circle less than half a mile from the finish. Jordan turned early, was called back, but wasn’t deemed to have fully corrected his mistake. In the end, Jordan crossed the finish line first but Ayala was the official winner in 17:04.7 after Arbor View’s protest was upheld. Jordan Hughes of Shadow Ridge was second in 17:13.5 with Arbor View’s Renzor West (17:22.5) edging Faith Lutheran’s Mark Wilbourne (17:27.7) for third. 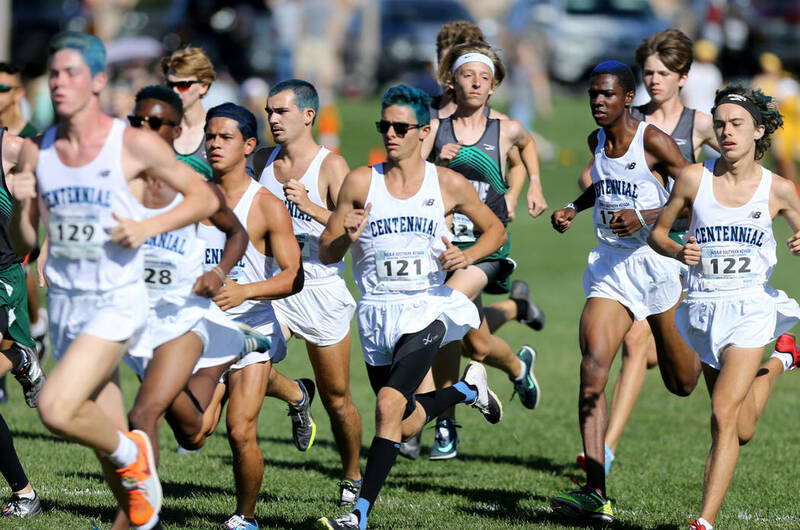 Centennial had six finishers in the top 15 to score 52 points, topping Shadow Ridge (58). If the initial Jordan-Ayala finish held, the two teams would have tied for third, but the change in the standings put Arbor View (62) in third and Palo Verde (84) fourth. Palo Verde is expected to still have five at-large individual qualifiers for next week’s state meet. Franklin took the lead early and then served as pacesetter for some of his teammates through the early portion of the race. However, he took control after two miles and cruised to the finish in 17:05.1. Valley’s Donovan Jones was second in 17:42.6, and teammate Aidan White third in 17:47 to help the Vikings win the team title. After Valley’s 45 points, Pahrump Valley was second with 62 followed by Somerset-Losee (72). Cook chose to hang right off the lead for most of the race, but made a decisive kick with half a mile to go, eventually crossing the finish line first in 17:52.4. Laughlin senior Gonzalo Sanchez was second in 18:05.6 followed by Beatty junior Jose Granados (18:11.3). The Meadows also scored 51 points to claim the regional team title with Lake Mead (77) and Laughlin (83) also moving on to state.